What is the Far Cry New Dawn Game? Far Cry New Dawn is a first-person shooter developed by Ubisoft Montreal and published by Ubisoft Company. The game is a spin-off of the Far Cry series and a narrative sequel to Far Cry 5. It was released for Microsoft Windows, PlayStation 4 and Xbox One in 2019. What can players spend Far Cry New Dawn Credits on? One of the first things for new player will do in Far Cry New Dawn is customize your character. Player will notice that a lot of the options are unavailable, requiring Far Cry Credits to unlock. So Far Cry New Dawn Credits allows the player to unlock items without needing the required rank or materials they’d need otherwise. 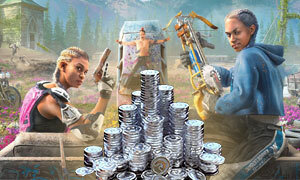 No doubt, each player wants to know more functions of Far Cry Credits what exactly are Far Cry New Dawn Credits used for? Well, player can purchase Weapons, Perk Points, Crafting Materials, Clothes, and Vehicles in-game on PS4, Xbox One, and PC platforms. Pretty much anything player would need to use in the game. Where can player Buy Far Cry New Dawn Credits? One way to get Far Cry Credits for free. There are Far Cry Credits hidden in the loot stashes you find as part of the Treasure Hunts. But this way will spend more time on it, for some of the more outlandish items, game player will need to purchase some more. So Joymmo.com recommends players to Buy Cheap Far Cry New Dawn Credits from our currency store online. For new customer, you will get big discount while purchasing Far Cry New Dawn Credits.